As the greater Niagara Falls region takes off as a golf destination, Niagara-on-the-Lake is becoming a sought after second home spot. The quaint town is an example of how golf can invigorate a real estate market. NIAGARA-ON-THE-LAKE, Ontario - This used to be one of those little Canadian towns that nobody ever heard of. It was close to Niagara Falls (within 25 minutes), but not close enough that the honeymooners and families with kids would come. As local Jay Hoge said, "It's a small town where everybody knows everybody else's business." Only wineries, a theater festival and, yes, high-end golf are suddenly making that business include a fair share of out of towners. As the greater Niagara Falls region takes off as a golf destination, Niagara-on-the-Lake is becoming a sought after second home spot. Homes with lake views now go for around $1 million. One of the large old Victorians that dot the leafy streets run in the $500,000 range. It's all quite a change for this 215-year-old town of around 14,000 people. Some clever marketing by the Chamber of Commerce has helped. What was once regarded as Niagara-on-the-Lake's weakness - a community feel light years in atmosphere from Niagara Falls' souvenir frenzy haven - has been turned into drawing cards. The emergence of a good dozen golf courses also stands out as a major factor. 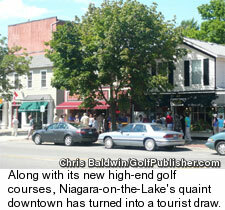 Niagara-on-the-Lake serves as a great example of how golf can help change everything in real estate. "With the golfers coming in, you seem to have more guys spending money," said local Taylor Lawson, who sees plenty of tourists as a bartender. "The hotels can charge a lot more, restaurants redo their menus with higher-priced food ... Tourism's really completely taken the town in a new direction." This direction shift includes some tourists deciding they want their own permanent place in quaintville. With many real estate markets around North America in a decline, Niagara-on-the-Lake motors on. "The prices aren't really leveling off," real estate agent James O'Connor said. "More people want to move in every year. It's a strong market." As O'Connor talked, he waited to tee off on his second nine at Niagara-on-the-Lake Golf Club. This nine-hole course that opened in 1875 was packed. It's hardly the only course in the region receiving extensive play either. Thundering Waters, a John Daly design minutes from The Falls that opened in the summer of 2005, draws crowds to the tee. Grand Niagara Resort also debuted its Rees Jones Course in 2005 and is scheduled to open a Greg Norman Course in 2009-10. With these new courses adding to existing standouts like Legends on Niagara - a three-course facility - golf suddenly took on a much higher profile in Niagara Falls a few years ago. That's also when more and more people started looking to move in - either with a summer home or a full-time residence. Niagara-on-the-Lake happened to be the right setting at the right time, with the right price for many. "If you compare the prices to Toronto for what you get, it's a great value," O'Connor said. "People from Toronto come down and are thrilled to see something more reasonable." 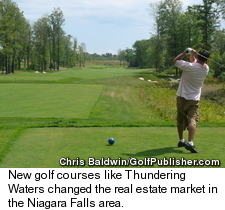 No one set out to build up golf in Niagara Falls to bolster Niagara-on-the-Lake's real estate market. This wasn't some brilliant community plan. It just happened that way, as it does in a number of communities across the continent. "The right golf course or courses can add a lot of value to an area that you might not assume would be a hot market," said Hilda Allen, a golf course broker whose company specializes in selling courses to both corporate and individual buyers. 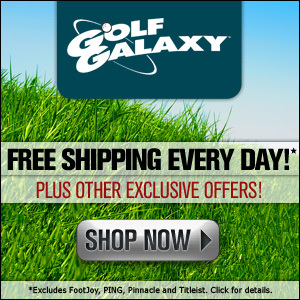 "In some cases, the golf courses can even change how consumers look at the market." It doesn't always work. All the golf in the world couldn't turn Utica, N.Y, into a hot housing market. For an unknown spot that has something going for it, though, golf can push it over the top. Niagara-on-the-Lake always had great fishing spots the locals could point you toward. It always had the views of that ultra-blue big lake. It always had great hiking trails, including the Niagara Gorge. It's downtown steadily became more sophisticated while maintaining its charm. Wine tasting shops and more adventurous restaurants opened right alongside bakeries that had been in the same family for a century. It wasn't until more high-end golf started popping up that it truly became a hot spot, though. "Tourism is huge," O'Connor said. "It really runs this town. From the Shaw Festival (the second largest theater company in North America that plays in three often sold-out theaters) to being 20 minutes from Niagara Falls, we get plenty of day-trippers. "I guess you need something like golf to get them to want to stay around all summer, though." It's good to be a golfer in the Niagara Falls region right now. It's also good to be a real estate agent for Niagara-on-the-Lake. Guys like O'Connor know that's no coincidence.